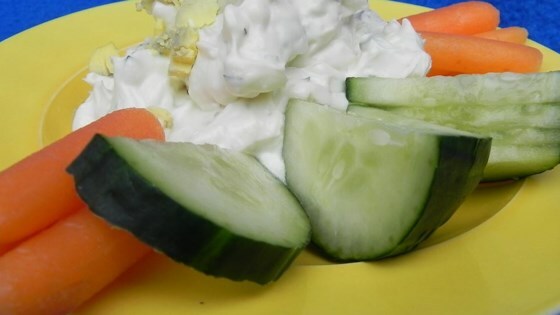 "This dip is different, delicious, light, and great served with raw veggies or crackers! Trust me on the anchovy paste." Stir together the cream cheese, mayonnaise, parsley, onion, anchovy paste, garlic powder, and pepper until creamy. Separate the egg white from the yolk; chop roughly. Stir the chopped egg white into the dip. Sprinkle the chopped yolk over the top. Chill to serve. This simple dip features all your favorite taco toppings in delicious dip form. I guess I'm cheating, but wanted to get a review in so people won't miss out on this. I've never been a fan of any vegetable dip, but love this!